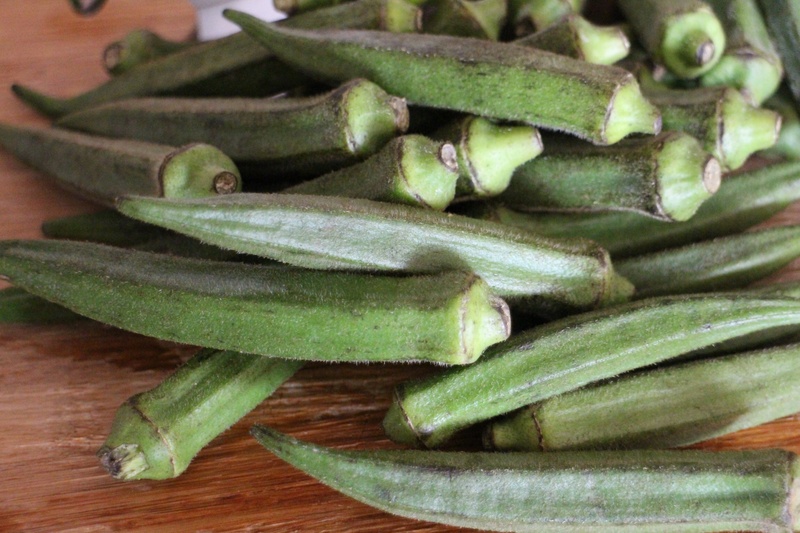 I’d like to be able to say that I spend my days wandering round food markets looking for beautiful, seasonal, fresh produce before deciding what will be on my lucky family’s menu that sunny day, when the truth of the matter is that it’s a quick look in the cupboards and fridge to see what can be used to cobble together a meal. 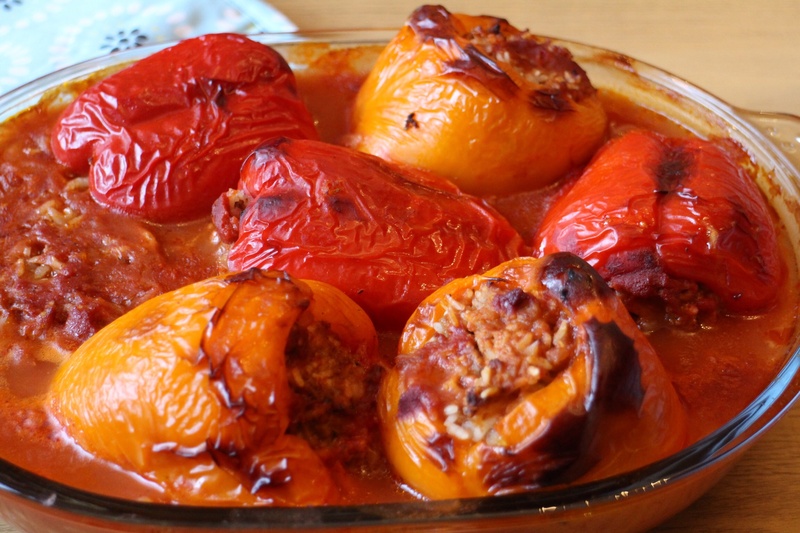 I’d love to have more time to lovingly cook my family’s Cypriot recipes on a more regular basis too, but the truth of that matter is that our favourite recipes are the rather more time consuming ones, involving layering, frying, rolling….perfect when one has the time, but rather less so when one does not. 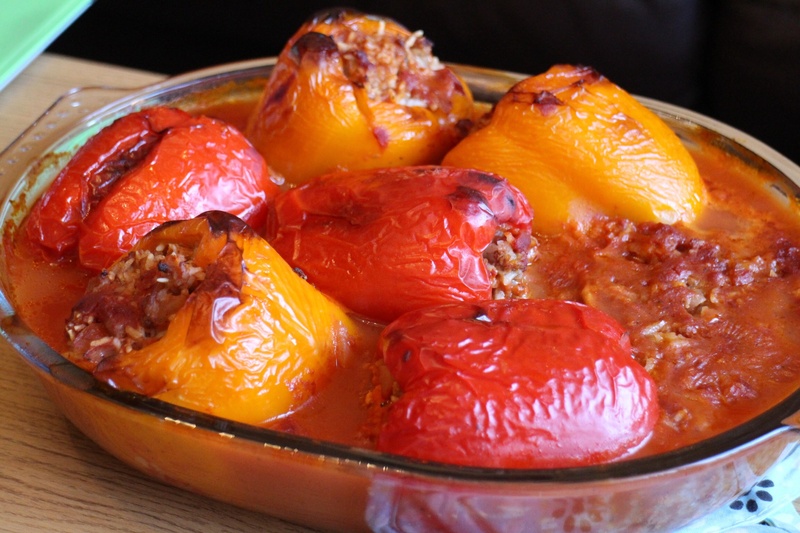 In as such, certain recipes have become ‘family recipes’, quick, easy, tasty, perfect for every day fare. 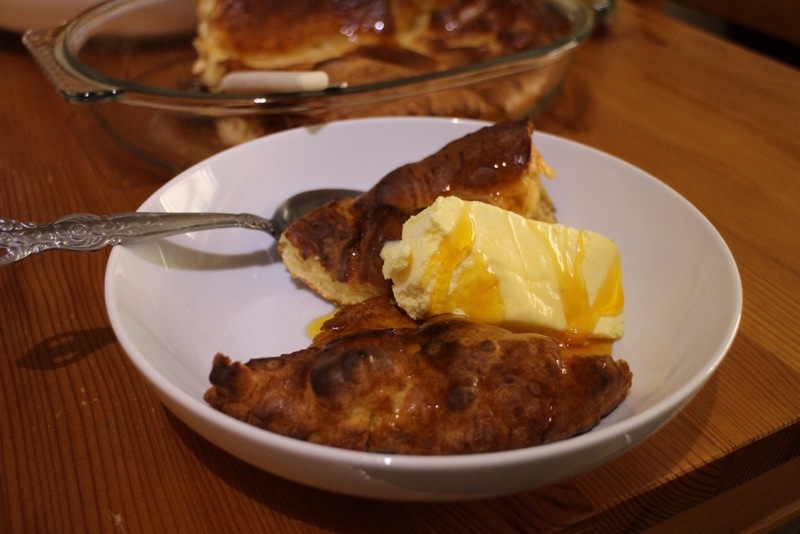 perfect for serving, as Nigella suggests – with golden syrup and ice-cream….. Adapted from Nigella Lawson’s book ‘How To Eat’. Makes 1 family sized Yorkshire pud. 1. 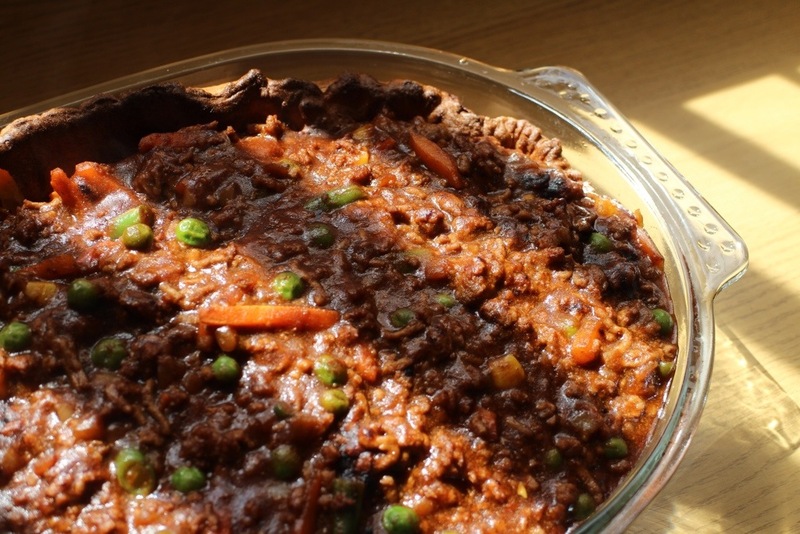 Put a pan (approx 30cm x 20cm) into which you have put 1-2 tbsp oil or dripping/ lard, into a very hot oven. 2. Mix 300ml milk and 4 eggs in a large measuring jug. Add half a teaspoon of salt. 3. Mix in 250g plain flour and a pinch of ground pepper. 4. Pour the batter into the very hot pan. 5. Cook for 20 minutes, after which time it will be beautifully risen and golden. Ps no apologies for using frozen veg and gravy granules. 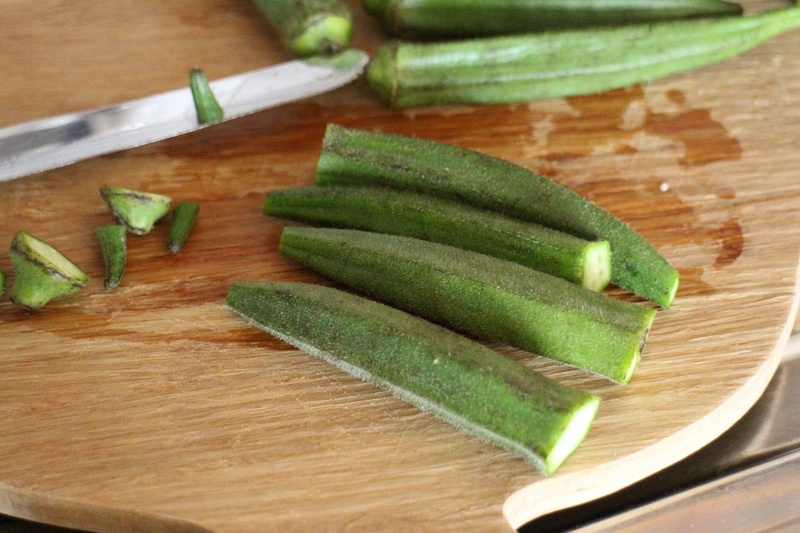 By all means though, peel and chop fresh vegetables if you prefer and use cornflour slaked with water to thicken the sauce. 4-6 tbsp Bisto Best gravy granules. 1. 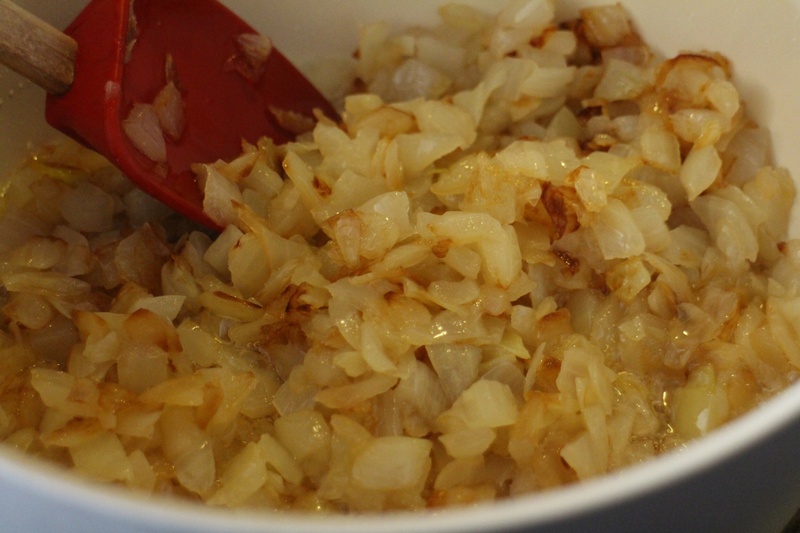 Heat the garlic oil in a large pan, add the chopped onion and fry for a couple of minutes until beginning to soften. 2. Add the mince and continue frying until no trace of pink remains. 3. Add the Marsala, sherry or wine and continue stirring for a minute or two so the alcohol reduces. 4. 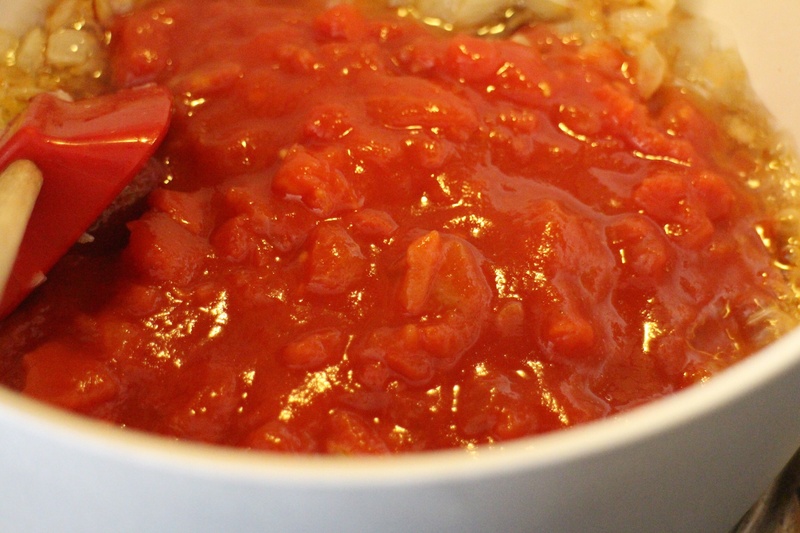 Add the Worcestershire sauce, chopped tomatoes and veg, then the boiling water. 5. 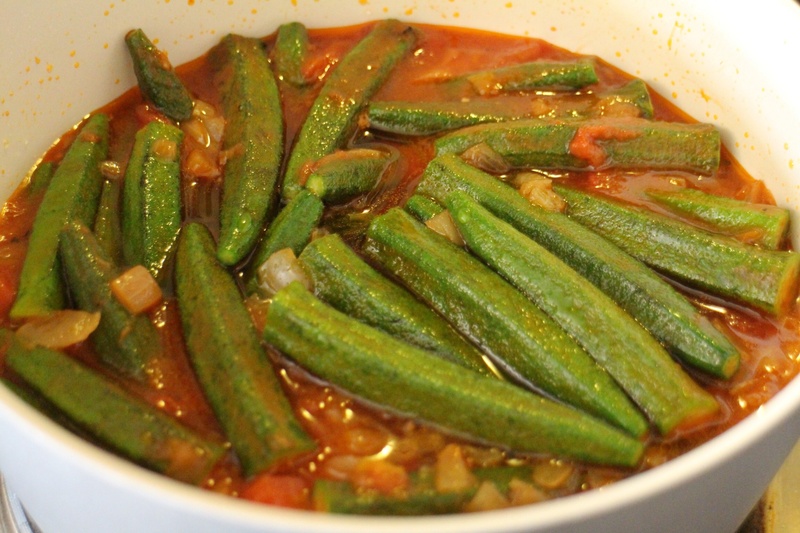 Bring to a boil, then reduce heat and simmer for 15-20 minutes. 6. Slowly add the gravy granules while mixing vigorously. 7. 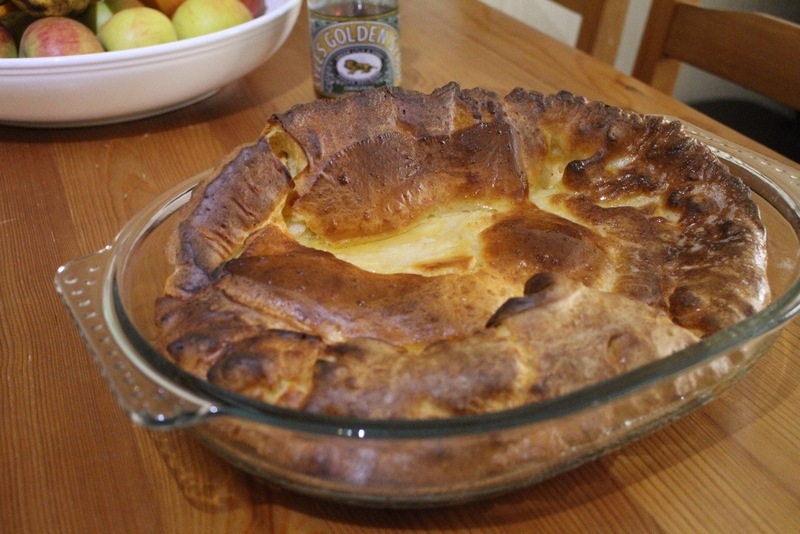 Use to fill the Yorkshire pud, or serve separately. Yummy either way. I never grew up with meatloaf…. ….At least I don’t think I did. Others? Maybe…..but us…. We may have grown up on squid and octopus and halloumi with watermelon…but not meatloaf. The first time I remember eating meatloaf was at my sister-in-law’s house in Cyprus, but there it was wrapped in caul fat and enclosed a layer of hard boiled eggs. Now, if you know me well, you will know I don’t do eggs. No way, uh uh, never! We can attribute this loathing to Mama Kouzari who fearing her little girl would be missing some kind of valuable vitamins and minerals that only eggs have, would try and feed me with it, only for me to spit it out. I would probably have the same reaction now. Unless of course they’re heavily disguised in a chocolate cake or something……. Mom, did you really do that? The best meatloaf I’ve ever had was a recipe that my Australian friend Coby supplied me with. 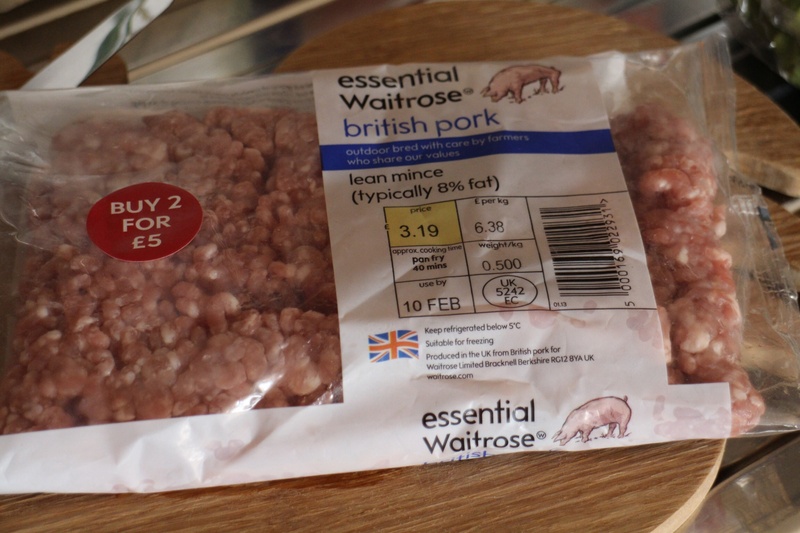 It’s great hot, served with mash or rice or whichever carb you prefer, but try it cold the next day in thick slices sandwiched between thick white bread. In Coby’s words “The sauce is interesting and really delicious in this. I don’t like coffee, but I like this sauce inspite of it. 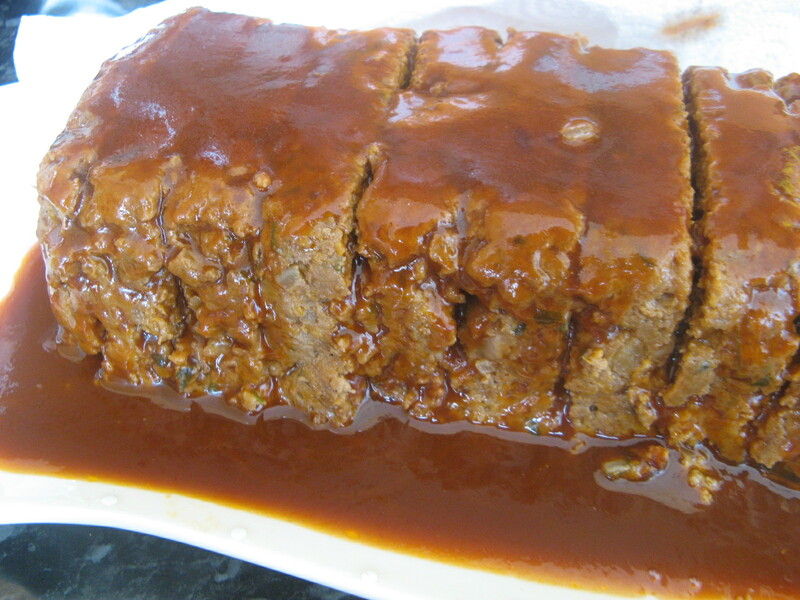 There’s always a long list of ingredients in meatloaf, but it’s super easy to just scrunch it all together”. Just the very idea that it’s there, makes it all a bit more adventurous and gets people intruiged and wanting to try it. Even though the finished sauce doesn’t actually taste of coffee…..
3 slices white bread, crusts removed and cut into squares. 1. Preheat oven to 180 deg C or 160 deg C, if you have a fan oven. 2. Pour the milk over the bread and let stand until milk is absorbed. 3. 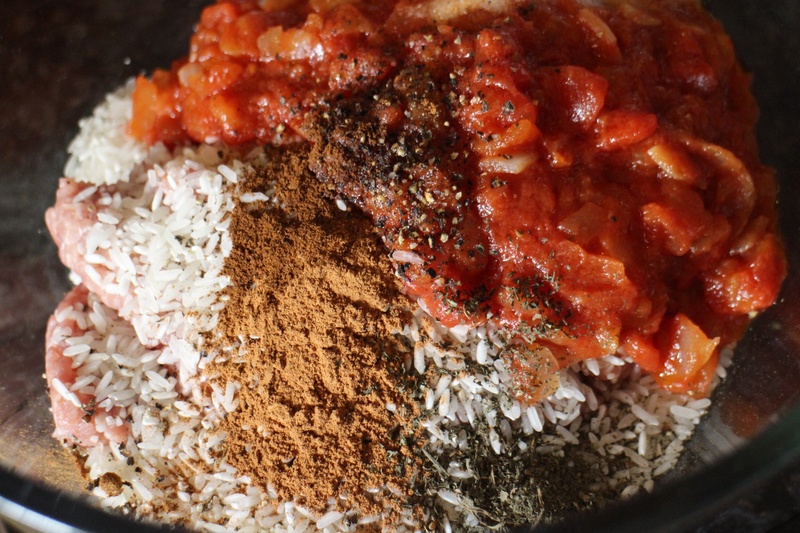 Place all the meatloaf ingredients in a bowl. Add the bread and mix until very well combined. 4. Press mixture into a greased 4 litre capacity loaf tin. Bake for 30 minutes. 5. 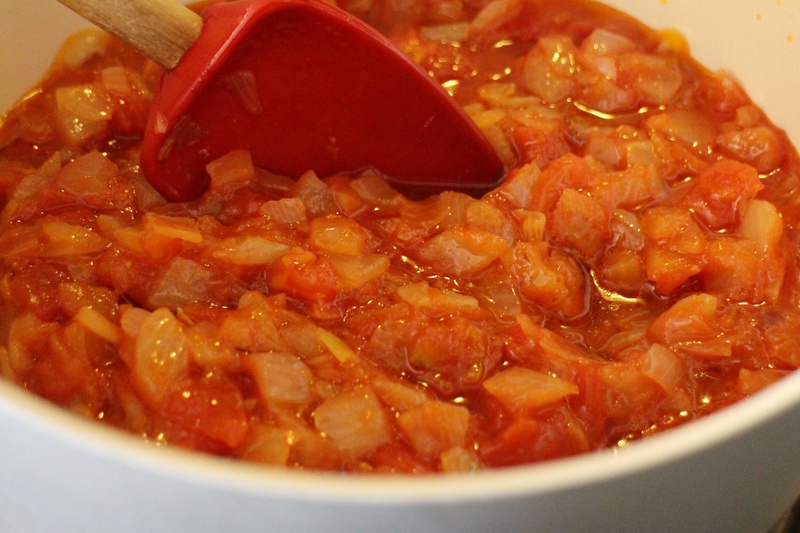 Combine the sauce ingredients in a small saucepan, bring to the boil, reduce heat and simmer for five minutes. 6. Drain fat from the meatloaf and invert onto a baking dish, pour over the sauce and cook for a further 30 minutes, basting every ten minutes. Thanks to Coby for a recipe which has become part of my family and our lives. Perfect for those days when you need a quick family meal, that fills tummies, but is tasty and a little spicy. 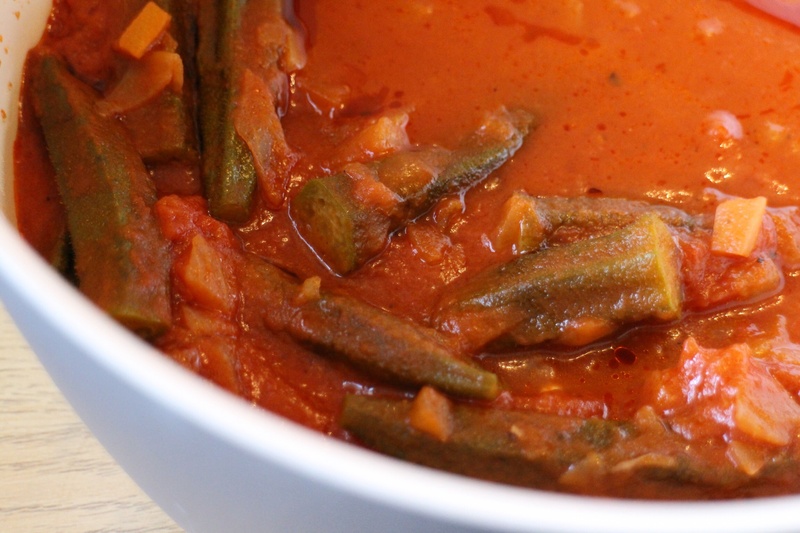 We enjoyed this, but I’d definitely add more Gochujang next time. Cook yer rice as you would normally do! 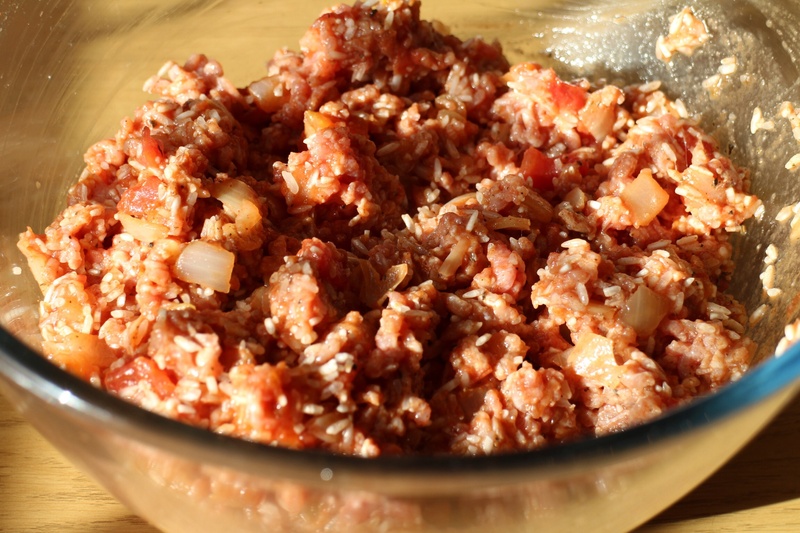 Whisk together the sauce ingredients and stir in the minced turkey, leave to steep for about 5 mins. When the wok is hot add the oil then the peas and spring onions and stir-fry for 3-4 mins. 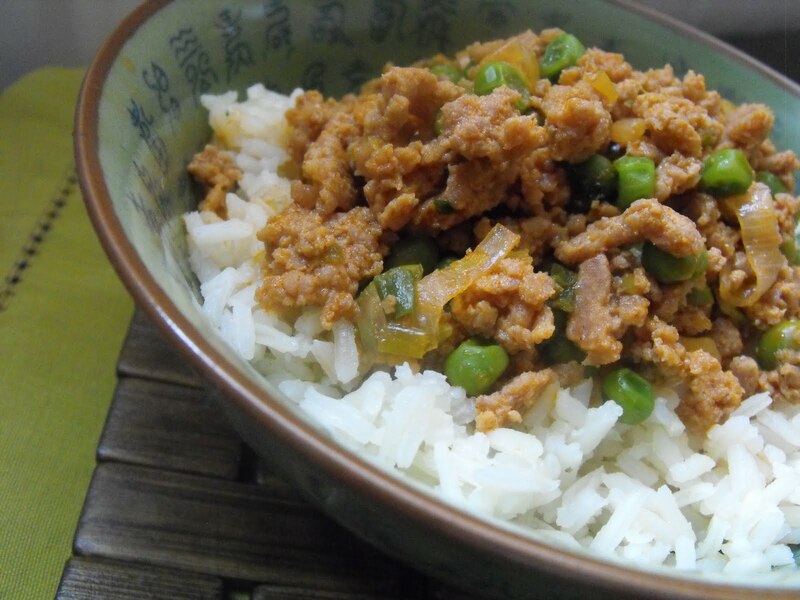 Add the turkey mince and sauce and stir-fry for 4-5 mins until cooked. Add the rice wine along with 4 tbsp water to swill out the residue sauce from the meat-steeping bowl, pour into the pan and fry for a further 30 seconds until everything is piping hot. Serve over the rice sprinkled with fresh coriander. Would I do anything differently? 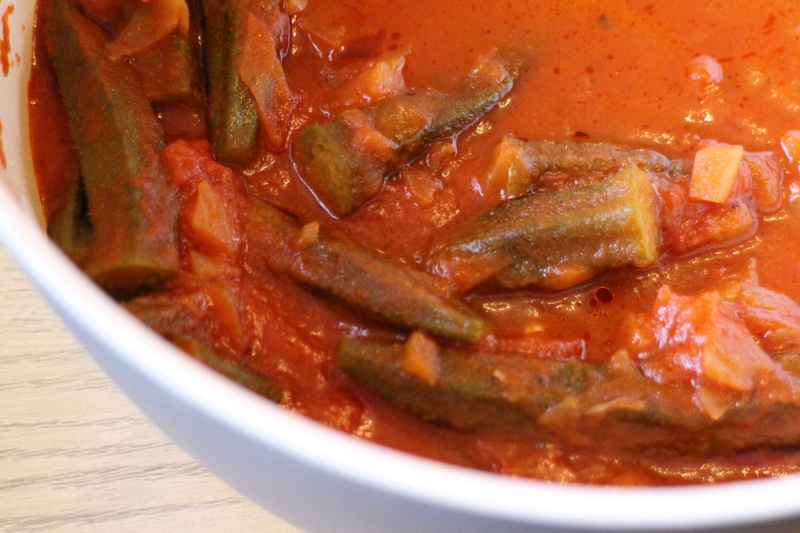 I’d add more of the spicy pepper paste – we like spicy in this family! Do you ever go through phases with your cooking? And sometimes, an Asian food phase. What got me into my Chinese cooking phase was a cookery challenge on another food blog ‘Belleau Kitchen’, where a book and recipe are randomly chosen off one’s bookshelves. In order to make sure that I didn’t cheat in any way, shape or form I asked my daughter to choose a book with her eyes closed, then open the book randomly, put her hand on a page and I would cook the recipe on that page. The book she chose was Ching-He Huang’s ‘China Modern’. And the recipe? Well, you’ll have to wait another day for that. 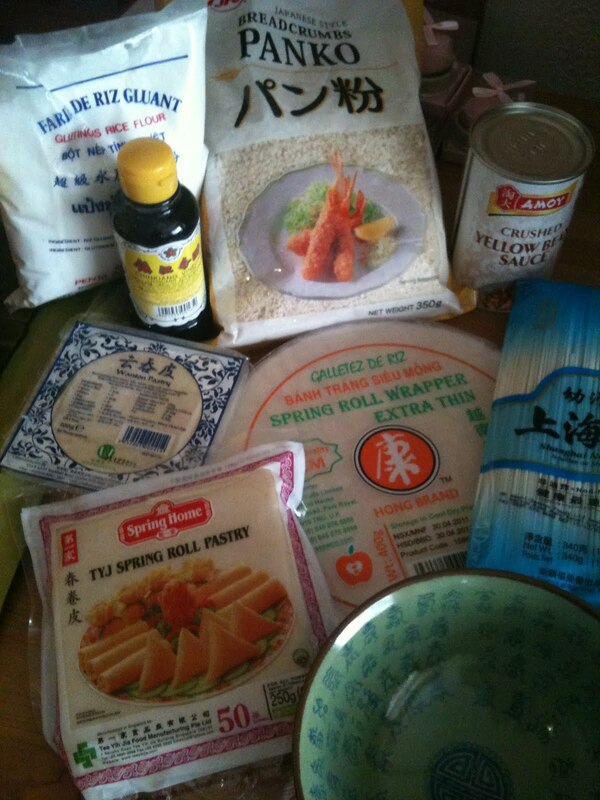 But that’s how I got into the Chinese cooking phase….luckily Birmingham has a thriving Chinese community, near to the town centre, there are numerous Chinese supermarkets within walking distance, so off I went clutching my pennies, with a vague idea of what I wanted and walked out with spring roll wrappers, wanton wrappers, Chinkiang black vinegar, yellow bean paste, panko breadcrumbs, glutinous rice flour, noodles and a pretty bowl…. But here’s what I made this time- my first attempt at anything vaguely sushi-ish. 12 fine slices spring onion. Mix marinade ingredients in a bowl, place duck in bowl and leave to marinate for as long as possible, ideally overnight. Unfortunately I left mine in the marinade for all of ten minutes, but it was fine. Drain the marinade into a pan and bring to a boil, this makes an amazing dipping sauce for the duck, yum, yum! Preheat your oven to 220 deg. C.
Place duck, skin side down in a wok or grill, cook for 1 minute on both sides until golden-brown. Place on a roasting tray and cook for about 15 minutes. I let mine cook for 20 minutes as I have an extremely anti-pink-meat husband! Put the rice and measured water in a pan with a tight-fitting lid, boil the rice until only a little water remains, reduce the heat and simmer for 10 minutes until water is completely absorbed. Remove from the pan and let it cool down for about 10 minutes, mix the seasoning ingredients in a bowl and pour into the rice, mix with a flat wooden spoon or spatula. 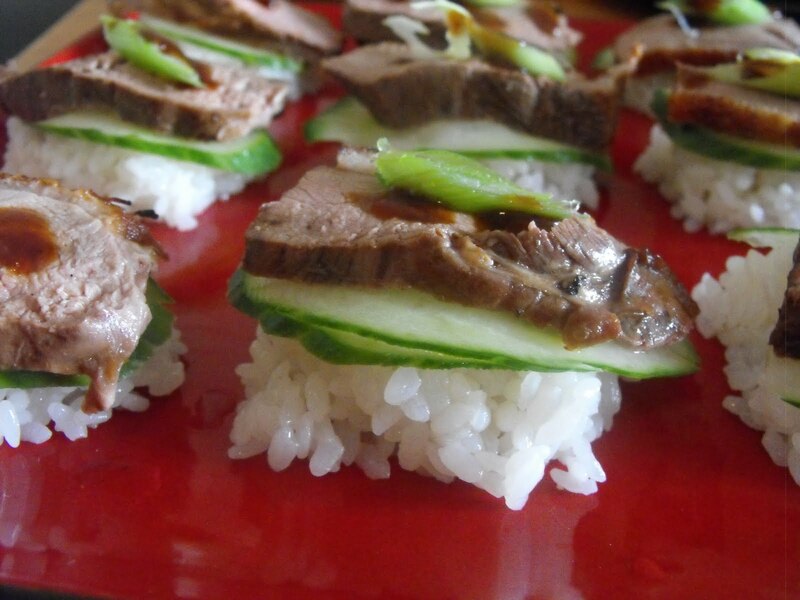 Take a tbsp of the sushi rice and shape into an oval mound (the rice is extremely sticky, so try wetting your hands beforehand, place a cucumber slice on top. 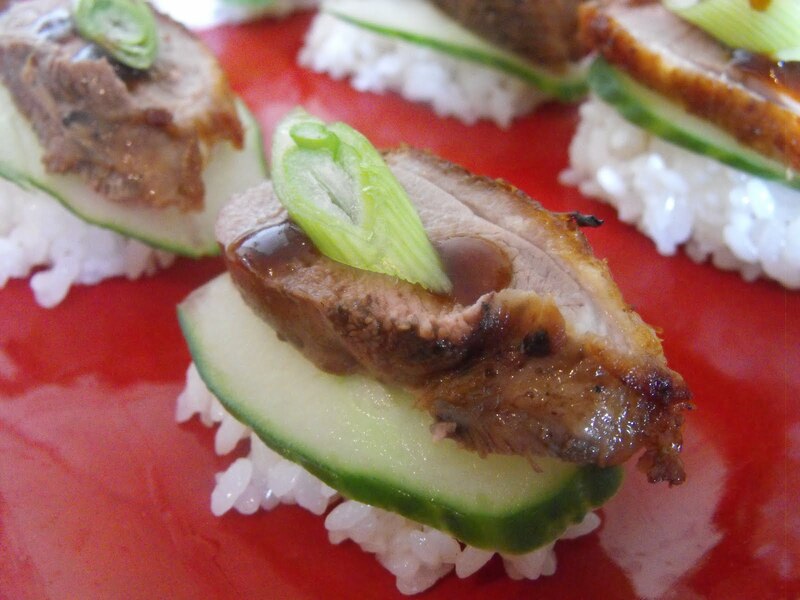 Slice the duck into lovely pieces, place on top of the rice mounds, shove a few into your mouth while no-one’s looking. Yep, you read right. Oh my Gosh! Are they GOOD!! Place slices of spring onion on top. Serve with that yummy dipping sauce. Serves one. Erm, sorry, serves 4. 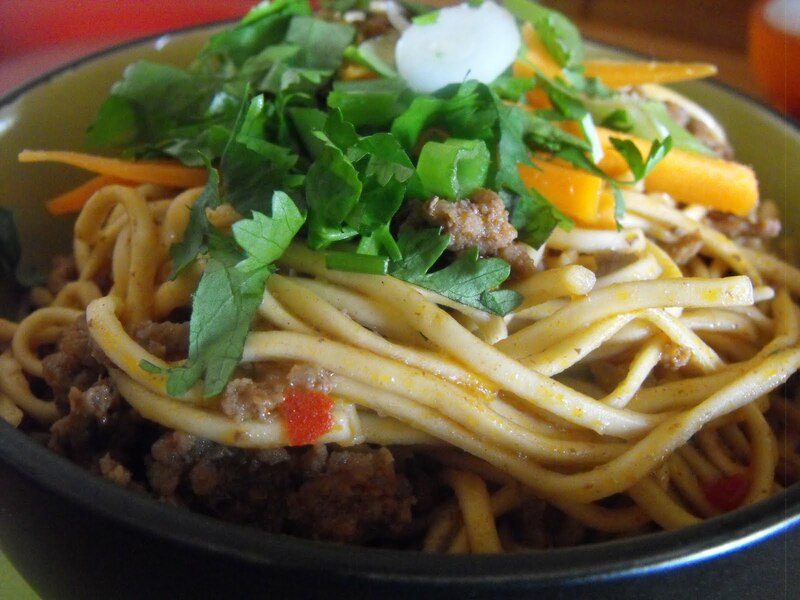 An uncomplicated and tasty noodle and minced beef dish. 1 small carrot, finely sliced into matchsticks. Heat a wok over high heat, fry garlic for less than a minute, add beef and fry until browned. Pour in sauce, bring to a boil and cook for about 4 minutes. 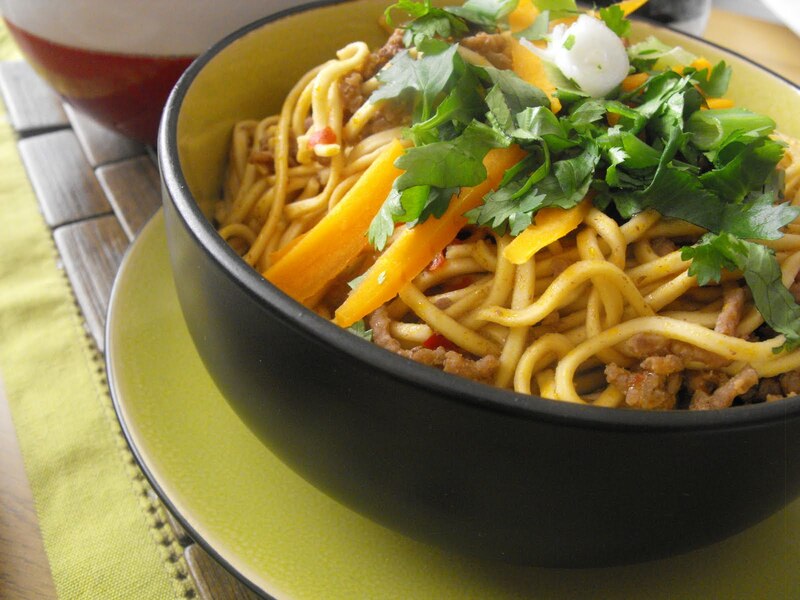 Cook the noodles, drain then divide between 2 bowls, sprinkle over meat sauce, then garnish with spring onion, coriander and carrot sticks. Both recipes adapted from ‘China Modern’ by Ching-He Huang. 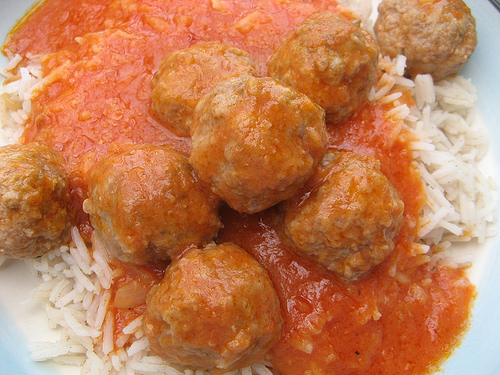 I made the meatballs and rice from Nigella Lawson’s brilliant book ‘Feast’. The ones from the kiddie chapter. I slaved over them. treasured them, made each little ball with love. 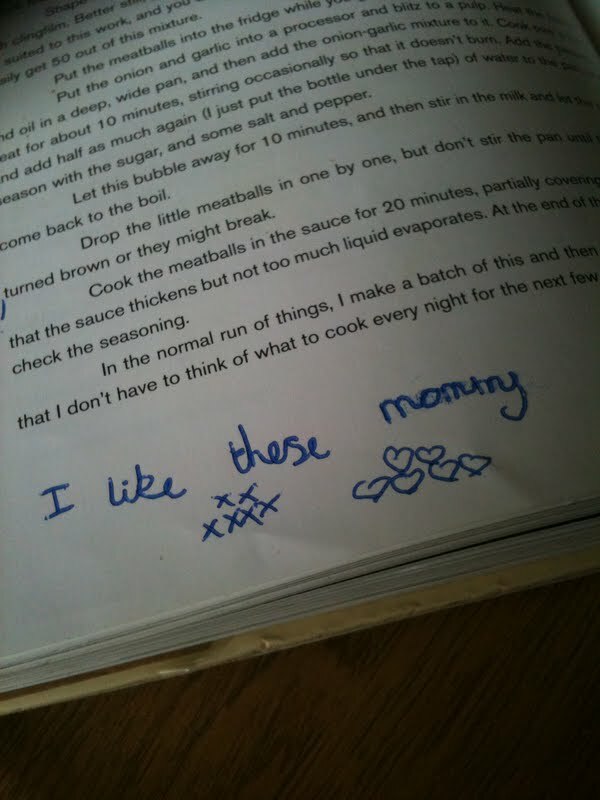 This is how my youngest daughter reviewed them a few years ago….. But now the family ask ‘What’s for tea?’…..then turn their noses up. Won’t even try them. Turn them into a curry**. then everyone eats them, raves over them, wants them again. Mind you it does look quite good right? 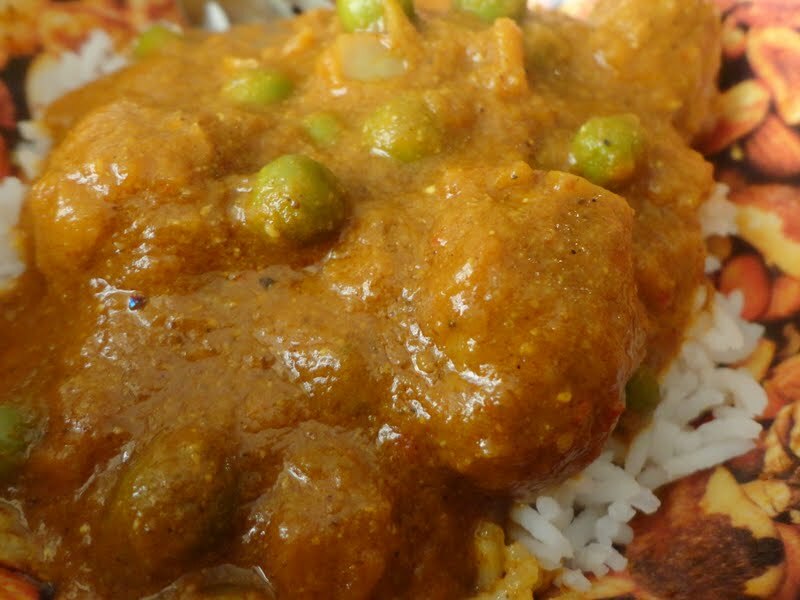 **I did this by frying off a couple of chopped onions in a little oil, adding 2-3 tbsp curry powder, which I fried for a few minutes with the onions to take away the raw spice taste. Then, tablespoon by tablespoon, add about 6 tbsp yoghurt, stirring between each addition until it is incorporated into the sauce. Add the original meatball recipe to the onion, curry powder and yoghurt, add a couple of handfuls of frozen peas, a few chopped fresh green chillies (We like things spicy so I tend to add about five of them!) and about a cupful of water, simmer for about 20 minutes. A couple of minutes before it’s ready stir in a small bunch of chopped fresh coriander and a tbsp of garam masala. Serve again.To rapturous delight this time. Surely every family has their own recipe for chilli con carne? It’s one of those meals, that takes little time or fuss to prepare, but pleases everyone. Basmati rice- 100g raw weight, per person. 1. 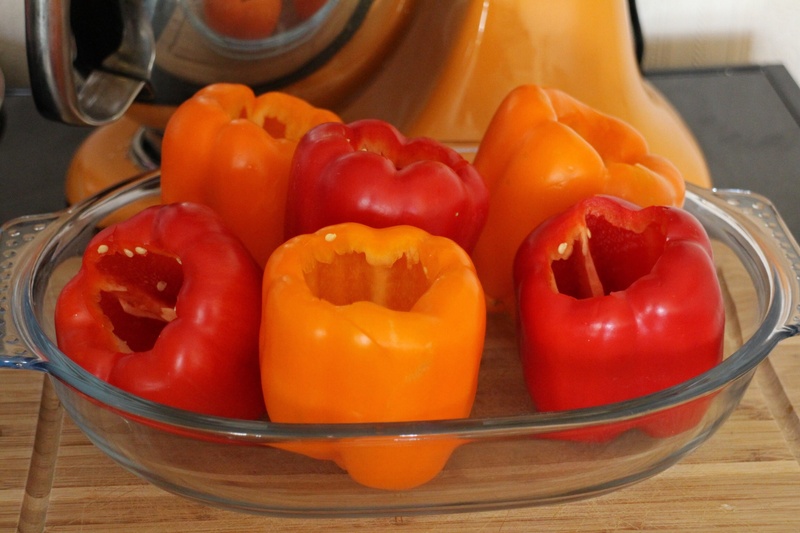 Fry the onion, garlic and peppers in the vegetable oil until softened. 3. Add the kidney beans, tomatoes, puree, corn, salt, pepper and chilli flakes and simmer for 20 minutes. 4. 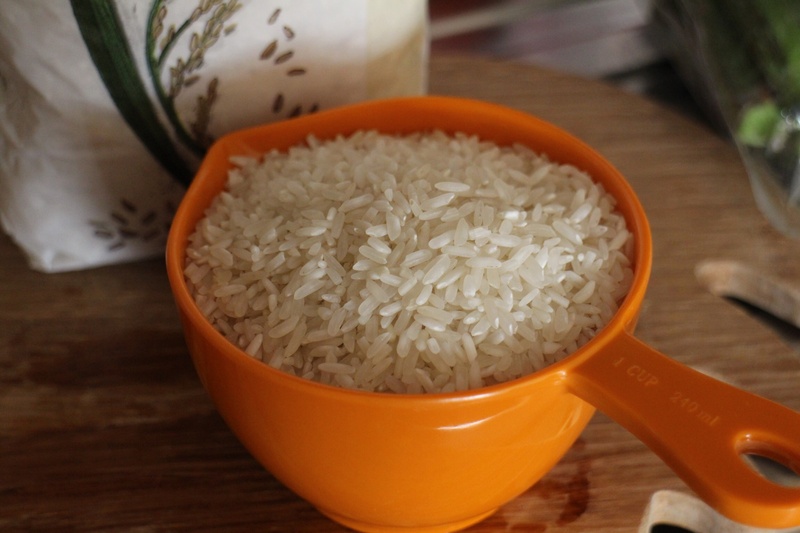 Meanwhile measure out 100g per person raw weight Basmati rice, steam or boil until cooked to perfection. 5. Feed the hungry hordes, then marvel at yourself how clever you are making such a filling, tasty meal which includes a good few portions of their 8-a-day!